A few days ago, we'd featured some of Gontaro's artwork, specifically of Marcus. Well, if you've been keeping track of the Kickstarter front page, you'll notice that two new characters have graced some of the sections: the noble veteran knight Lance Guilliman and the battlemage Zarum, both of whom will become vital to your squad's successes! Lance Guilliman belongs to a sacred order of knights whose oath upholds the ideals of chivalry, serving more as protectors and defenders rather than offensive might. Because of this idealism, their numbers are few, but they command a great deal of respect in the Kingdom of Stern. Lance's conduct is considered exemplary amongst the Order and if he has any weakness at all, it's being unable to say "no" to anyone in need, even if it puts a great burden upon him. Then there's Zarum, whose temper is only rivaled by his power. When Tolkien wrote the warning that states, "Do not meddle in the affairs of wizards, for they are subtle and quick to anger," he might have been referring to the Istari, but this is advice that those who encounter Zarum ought to heed, for when Zarum gets angry, the only things left in his wake are death, destruction, and suffering. A Final Fantasy IX Vivi he ain't! FINALLY A WIZARD THAT RESPONDS TO INTERRUPTIONS WITH FIRE AND BRIMSTONE. Seriously...just try to annoy a scientist working on a cancer cure...see how they react to you constantly going "What are you doing?" "When are you coming to bed." "Its your turn to look after the kids." IT IS NEVER PRETTY. _Exactly_. I love the use of Dragon Warrior, the name that we remember pretty well. Ahh. Definitely Lufia 1 and 2. @ Fabian Kuriyama Bessa - "Too Much Westerns" ... maybe if we are talking about comparing to modern day JRPGs, which ooze cliche anime fan-service like it's going out of style. However, if you compare it to the concept art for lots of the classic JRPGs (original FF's, Dragon Warrior...that sorta stuff) you often saw art comparable to this. They also utilized the chibi and anime influences to a limited degree, but this whole idea that JRPG is visually defined only by what it's turned into in the last 10-15 years is kinda insulting to the roots of the genre. He also mentioned that he posted them in dropbox. Can I have this in dropbox or did I just miss something? Yes, Gontaro is really good. But Credits are for Moriga, who did these ones. Really love the sober and dark charisma of Zarum. Upon further musing with this, these characters are a bit of a refreshing start compared to the previous set of characters that were introduced. This actually makes me pretty hopeful with the balance of both both East and West influence. I am further alleviated that everyone is not some pretty boy. Zarum, as I mentioned is my personal favorite. With that noted, you will have my continued support for the game. Granted, unfortunately, as I noted, payment won't be able to be extracted upon closing. I will have to send the payment via Paypal for the CITIZEN tier on the 13th, which is a payday for me. Overall, feeling Lance and Zarum more than the other characters so far. So, you definitely have my support for this. Awesome character art. Though, I seem to remember an awesome scene in FFIX when Vivi's anger finally fills him to a point where he just goes ballistic. Awesome ! Great job ^^. I would pay lots and lost of money for FF9 remake or JRPG in a similar style and execution. They really are awesome ! GONTARO is a nice artist ;-)! Nice update. Really like the differing designs so far. Zarum looks cool. Don't think he has to be evil, just not caring for good, evil, balance...sort of "Why should I care? I'm a powerful mage! You don't want to see evil? Don't bother me with stupid quests then, and don't even dare to get in my way"
Haha, I feel that the last line is directed to me (I stated in Facebook that I was expecting Zarum to be some kind of Vivi). But yeah, he definitely seems an interesting character on his own. I wonder why he joins your group, though. He seems "Neutral Evil" at least. @Cesar Garcia: I don't know, I find that both Marcus and Lance stand out, but they would be able to blend into the crowd as well. And that isn't bad. But at the end of the day, each opinion is different –and respectable. @Dedee Trabletoon: totally agree with you! In fact I was worried that there would be too many japanese-inspired characters, especially after seeing both the ninja and the samurai. But now I'm fine, I trust their judgement. We'll see, I'm anxious for the story update! Zarum sounds and looks like a villain. Nice design! A Nomura zipper game its ain't! I really like the artstyle and looks like the characters have strong personalities. Awesome work. Zarum must be a high level mage if he can wear armor like that and still cast spells. I disagree with the comments here about Marcus and Lance. 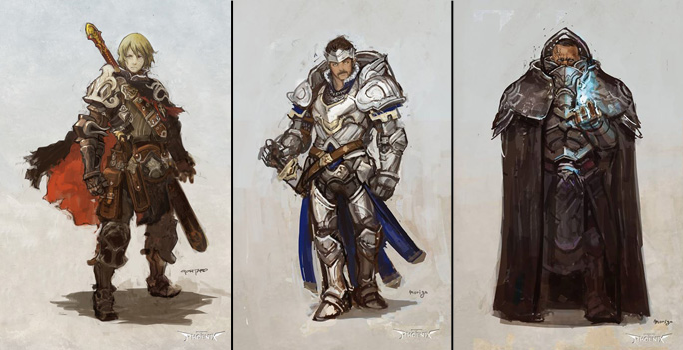 I don't believe hey don't look conservative at all, just because they're main characters doesn't mean they need unecessary "flare" to stand out (e.g belts and zippers)....I think their armor styles, stances, and overall aesthetic give you a solid impression of their personalities and backgrounds. Overall great work so far, can't wait for more! Upon further review of this update, I think this one is a bit better and more substantial than the first one that barely introduced Marcus. We have a good idea of the characters and heir place within the group to some degree. Personally, I like the personal touch that Zarum is a dark-skinned(black?) male. That just may be the artwork, but I don't know. Overall, I like and appreciate this update. While this would had been good for the start of he campaign... better late than never. These look good so far, but they're still works-in-progress right? I like the ideas behind the characters, especially Zarum. Never trust Wizards. The more power they have, the more they forget of how mortal they are. Really nice to see more characters! Keep 'em coming! Big fan of the Lance Guilliman design. "A Final Fantasy IX Vivi he ain't!" Too much westerns to my taste but still good. I liked the previous characters more than those.